There is no doubt about it, our bodies need fuel. Without it, we become physically weak and mentally drained. We would be unable to function without the daily allotment of calories our body requires. This budget category contains all monies spent on groceries each month. We also include money used to eat out, whether that is a dinner date with the family or paying for kid lunches at school. Those trips to your favorite coffee house count in here as well. The percentage of money spent in this category can vary greatly depending upon the size of your family. A single person could spend very little while a family of six (like mine) could break the bank some months. You can look for ways to cut back here by using coupons, buying and cooking in bulk (then freezing) and eating at home more instead of your favorite restaurant. Will Smith brilliantly portrayed the one-year homeless life of Chris Gardner in the movie The Pursuit of Happyness. But who really wants to go the homeless route with their life? I would much rather come home to my own bed every night than spend it in homeless shelters or a subway bathroom. 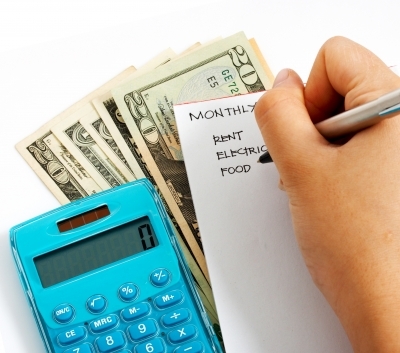 This budget category covers the mortgage payment or the rent check. Some people might include home maintenance expenses and homeowner’s insurance in this category. However, we have chosen to have separate expense categories for those things. There happens to be many items that fall under this category, some necessary and some optional. The necessities would include electricity, water, heating and cooling and phone service (including the cell phone). Trash most likely is another necessity, although I know some who can haul it to the dump or dispose of it at work for free. Optional utility items would include cable television service, Internet access (although that’s almost a necessity) and a security system. I call these optional because a person could do without them if they needed to cut expenditures from their budget. This is pretty self-explanatory: you have to cover your body with clothes in public or you will get hauled off to jail. Clothing budgets can vary greatly. And it’s really easy to go beyond what is considered “necessary” and buy more clothes than we really need. This one, along with the food category, are the ones of the five main expense categories we are most likely to overspend in each month. Reliable transportation is a necessity. Our ability to earn a living would be severely compromised if we couldn’t get to work each day. This doesn’t necessarily mean a person has to own a car though. Public transportation such as a busing system, subway or train service and taxis are widely available. My dad biked to work many summer mornings, as his office was only five blocks from our house. The transportation category will include the car payment, gasoline and vehicle maintenance. You should also put car insurance here. Some states even have an advelorum tax on vehicles that comes once a year. Budget a little for that each month so you are not surprised when the bill arrives. Your budget will have many other expenses categories related to items such as kids, healthcare, student loans, entertainment and charitable giving. Those categories can be sorted out though once you have the five big items squared away. They are necessities that, when secured, make living life a bit easier. I gave you some percentages in each budget category to shoot for. Don’t get too wrapped up in those that it frustrates your budget plan. They are only meant to serve as a guide and are completely adjustable based on your circumstances and income. With that in mind though understand, it certainly wouldn’t be the wisest move for someone making $500,000 a year spending 15% of his or her income on food. That’s a bit much. If you are spending less in those categories that’s great! If you are spending a little more, that might be OK as well. With a family of six who is always on the go, we occasionally go over in food and transportation (due to eating out and the need for gas). Some months we miss to the upside on clothing, especially around the beginning of school. But every month we are way under the low end of 25% on housing because we have no mortgage debt to plan for. So don’t panic if your budget comes in 2% over in a category at the end of the month. Analyze it and find out what happened. Make adjustments where necessary. The goal should be putting the percentages together in a way that works for your situation. If you’d like to see all our expense categories or want a budget template to use, you can access that on my resources page. Questions for Discussion: What experiences have you had when you attempted to plan a budget? What percentage of your monthly income goes to the BIG 5? What expense category in the budget do you most frequently exceed? I used to have a problem budgeting food especially at the start when I became of conscious of what and how much I was spending, but conscious and responsible budgeting has to work no matter what so basically I do adjustments and some sacrifices. The food budget can easily get away from you. It’s a real challenge to get control of that one, especially for big families or those constantly on the go. If you have them, student loans should be factored in as well. Good point DC, as they are a big expense. I put those, and things like health insurance, on the second tier of things to focus on. I felt these top five were pretty much key to everyday survival. We barely spend anything on clothes….I’m um…..garage sale chic? The rest of those expenses are definitely a necessity, although we try to spend as little as possible! We went through a stretch where we spent so little on clothing it almost became a problem. It was a problem because instead of staggering out our clothes spending for each person in the family, all six of us needed new clothes all at once. That was a tough month on the budget. We are more balanced now and allocate a certain amount for each family member to spend each month if needed. We are under on all those, but I would still like to spend less on food and gas. We went on a juicing kick this month and spent lots on produce. It’s hard not to shell out more for healthy food. I’m also kind of thinking we do need that lamborghini. Do you think a booster seat will fit in the back? Haha! I don’t think they had young children in mind when they designed that one. Just the kid in our adult heart that wants to take that to the German autobahns and open it up. Janeen recently posted…Is an Apple Watch worth the cost? I tend to exceed the food category most often. This though is due to me intentionally keeping it low so that I don’t tempt myself too much with eating out. I can see how keeping the food budget low works as a strategy to keep you focused on your spending habits. Good plan! These categories are a great place to start, especially for those who have never budgeted before! I think so. It’s where we started and then organized all the other categories around these five. Food is something that we usually have a problem with keeping under a certain amount. Luckily our housing is lower than ever. I think it’s around 5%! Sounds like you are in the same situation as we are – high food cost, low housing cost. I’ll take that scenario! I spend more on housing and food then most people do. I can probably adjust the food budget more, but the housing will stay the same unless I make more as a freelancer. The upside is my utilities are VERY low, as is my transportation costs. Seems like everyone has a different scenario which is why the percentages have to be adjusted to fit your individual situation. Ah yes, my car is the only thing, percentage-wise, I’m over on. I realized that right after I bought it, and the stress of debt settled in soon after. However, I pay very cheap rent and spend very few on groceries (some months I’m awful at going out to eat though) so it helps make up for it. I like the post here. While there are a lot of other things to consider, going back to the basics for me has really helped, and these are the categories I generally include. Everything else, and for me, technically, my rent is considered a fixed cost. I pretend like I don’t even have the money in my checking to spend — things like loan payments and any extra payments I tell myself I’m going to make, my rent plus extra for electric and anything else, etc. If I happen to have money left over, it just stays there in my account for the next month, or goes into savings! Glad this was helpful Kayla. Sometimes getting back to the basics is the best place to start. Great information. I can definitely use the information concerning percentages. I wasn’t really sure how much of my income should go towards food. The percentages are helpful but again it also depends on your income. Perhaps you could get by on less than 5% for food, especially if you are single. High income earners will have to adjust their percentages so they are not spending too much in one category. I like your point at the end about these percentages service just as a starting point. As you say each situation is different and individual circumstances may dictate a different breakdown. I would add that all of these things should be looked at within the context of your larger goals, which may require you to spend less in some of these areas or may allow you to spend more if you want. “…should be looked at within the context of your larger goals…” That’s a great point Matt! All of our goals are different which will change to what category we allocate money each month. Thanks for sharing the percentages, Brian – that’s a huge help for me as I revisit our budget this month. Big help! I’ve found the percentages really useful as a starting point. As I said, they are only a guide to get the budget started. Adjust them as you see fit. But I would be cautious on adjusting them to the upside, above the suggested percentage. Rent is by far my biggest expense, and food is probably the category I exceed the most. Thankfully, utilities are included in rent, otherwise I think they would be a little tricky to budget for. My car is great on gas, and is low maintenance, so that would come last. I barely ever purchase new clothes anymore as I think I have a decent amount to last me for a while! With six in the house, the food budget challenges us every month. Nice that all your utilities are included in the rent. That’s means less to worry about.